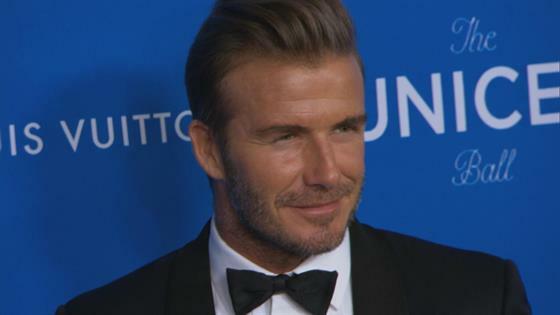 Just in: You can thank Victoria Beckham for David Beckham's flawless skin. "My approach to grooming was always to steal my wife's products," the former soccer star told Into the Gloss. "That was kind of it, really. I'd always been aware of how I wanted my hair to look, stuff like that, but I was also in a career where I was always outside...I had to take care of my skin because of that, but the way I looked after it was to steal my wife's stuff, because I know she has the best." Victoria, who has been working with Estée Lauder on makeup and skin-care, believes "Glowing skin is all you really need," and has surely spread this message to the members of her family. Case in point: "The first time I did a mask was pretty recently, actually," David revealed. "I tried the Tom Ford clay one, and I really like it. I very rarely have the time to do a mask, but Victoria loves to do it before she's going to bed, or when she wakes up. Making the time to go for a nice facial is important—it doesn't just make you look better, it makes you feel great as well." Now, David is putting down the products in his wife's vanity and creating products that meets his needs in partnership with L'Oreal. "I created House 99 to give people the inspiration as well as the right products to experiment and feel completely at home doing so," he said in the announcement of his skin-care collection earlier this year. "House 99 is here to support men, to give them the tools they need to create whatever look they are going for. Welcome to the house." Since the release, the brand has kept its promise to service men, including a new release in time for the holidays: the Tattoo Body Moisturizing Cream. "To create something like this, and to make a line with a Tattoo Body Moisturizing Cream, and things like that…those things really make it authentic," he said. "It's been a process I've really enjoyed because I look after myself a lot better now. I never used to use face wash, apart from using my wife's products. I never used to make the time to do that." In his house, where beauty secrets are shared, he's teaching his newfound skin-care secrets to his sons, Brooklyn Beckham, 19; Romeo Beckham, 16 and Cruz Beckham, 13. "The first time my son Romeo shaved, I shaved him—he literally had a fluff on his face, but he was quite excited about his dad shaving him," David said. "Brooklyn, the same. I'm sure I'll have to do the same to Cruz. As far as I can remember, I've always had some kind of stubble. I've worked out that I look better with some stubble than without."